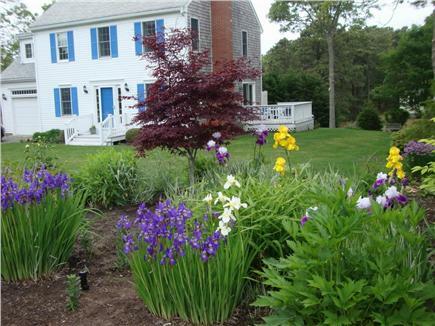 Beautiful Colonial: 3Bdrm, 2Ba, Central A/C-Walk to Beach! Entrance and living room-Flat Screen HDTV streaming NETFLIX! Queen Bedroom Faces South Lots of Cheerful Light! 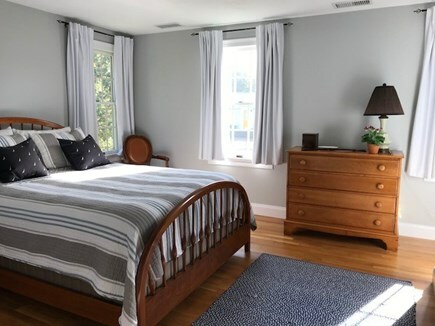 Twin Bedroom - cheerful, afternoon sun! 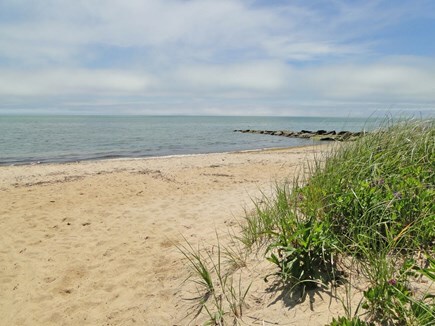 This lovely home is a .4/mile walk to Pleasant Street Beach. The house is located on a private road. The house is open floor plan. 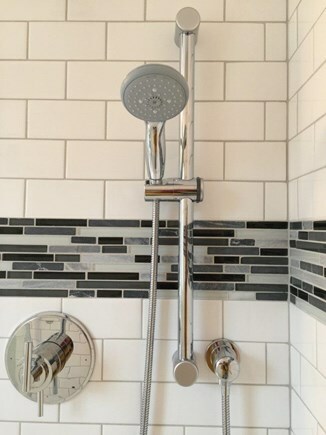 There is an outside shower-all important for kids & adults returning from a long day at the beach! The kitchen is fully equipped with a new Bosch DW & has everything for the gourmet chef.There are French doors in kitchen leading to the deck with table, chairs & new Weber Stainless Steel gas grill. The lot is good sized, professionally landscaped with great turf for badminton or croquet- both at the house. 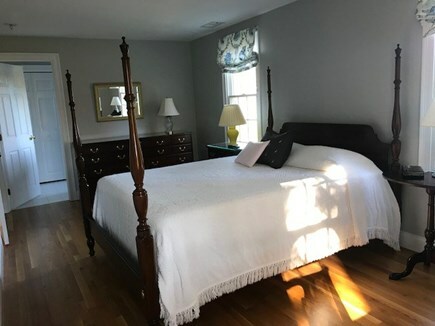 The first floor features a dining room, living room with L-shaped sectional queen sleep sofa, cable 55'' UHD TV-streaming Netflix, remodeled spa like bath with washer/dryer & Comcast high speed wireless internet access. The home has 2 zone central A/C. The basement has a Ping-Pong table. 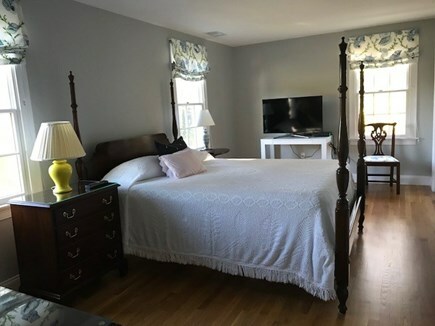 Upstairs is the large master with an iComfort queen bed, 42'' HDTV-streaming. Also, there are 2 spacious queen size bedrooms: 1 with a Sterns & Foster queen bed, and the other with a set of twin beds. The exterior & interior of the house were painted last year. Pisces Restaurant & The Talking Pig are a short walk down the street, the bike path is .5/mile ride from the house. And there are lots of activities for kid & adults. Concierge services available, (sheets, towels, groceries, etc) please contact owner for more info. Additional availability info: Concierge services available. Please contact owner for details. This is a Saturday to Saturday vacation rental. Additional pricing info: Cleaning $ 200. Linens available for additional cost. Contact owner for details. State and local taxes of 12.45% will apply. Spent a long girls' getaway weekend in this lovely home. The home is impeccably clean, marvelously decorated and accommodated six of us very comfortably. The kitchen is well stocked and its island central to all first floor living space and the deck is a great gathering place! The yard is landscaped beautifully and the outdoor shower was a particular pleasure on the sunny morning it was used! 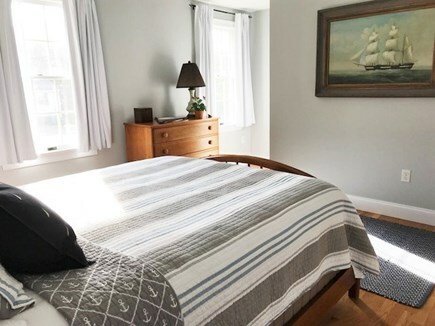 With walking access to the beach and Chatham's charming downtown shops a short drive away, the house and its location are the perfect location to unwind and enjoy! We cannot recommend this highly enough. From initial inquiry through to a seamless departure, Susan was an excellent owner to deal with, and very facilitating of our requests and questions. The property is kept in immaculate condition throughout (Listing was exactly as described), and conveniently located for beaches, restaurants and access to the cycle trail. The outdoor shower, barbeque and garden games were a great hit with our kids. Both the property and its owner come Highly Recommended! This is the cleanest and most organized home I've rented through Home Away or VRBO. It’s bright, open, the rooms are large, and best of all the beds are comfortable. The gardens are well kept and if you look closely you’ll find some tasty nuggets that can be used in your dinners. The location, a mile from the bike path, was perfect for us. It’s also close enough to Chatham center for quick jaunts but tucked away in a quiet neighborhood. Don’t miss the Impudent Oyster for a great meal and don’t judge a book by its cover, try the neighborhood gem, Pisces. If you need a “refreshment” while touring Chatham walk to the Chatham Bars Inn and relax on their Adirondack chairs. If you have children a short car ride to Skaket Beach on the bay side during low tide is a must. You can walk almost a mile into the bay and wide through tidal pools finding all types of sea life. Susan, the owner, was very communicative and the home’s notebook is full of information. Don't pass on this home. 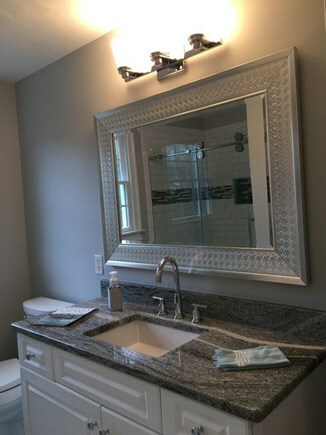 Very nice home in the charming town of Chatham! It was very spacious, nice bedrooms, great kitchen and the deck off the side was wonderful. It was in a great location, 1 block from the beach and a short ride from several other beaches. We were extremely satisfied with everything this house had to offer...We even played croquet in the front yard! Beautiful landscaping as well. We drank our coffee on the side deck then took a morning walk through the neighborhood...lots of very cute houses! For a family of 6 adults...it was an amazing stay! 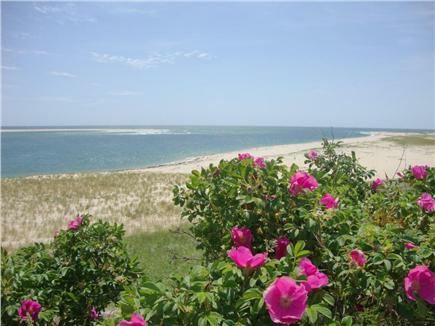 Immaculate home with easy access to Chatham, Nauset Beach, Captain's Golf Course and short drive to outer cape. Neighborhood is very quiet and yard is well maintained for a great atmosphere any time of the day. The amenities far exceeded our expectations and look forward to many more summers there! This was a lovely and immaculate house. The kitchen was well equipped with everything we needed and the gardens are great to relax and for the kids. The outdoor shower is a plus. The beach is a bit of a walk, with small kids you'd be well off with a wagon or to drive. Pretty close to Chatham center and many beaches. Only down side for us was that linens were not provided - we were traveling by car and had to pack linens for all the beds and towels for the bathroom. I wouldn't be able to do this if coming by plane.